In a free market system, investing in foreign companies is nothing out of the ordinary. Germany operates several plants and owns several companies in the United States for example and nobody ever complained about it. When it comes to totalitarian regimes like China, however, things are different. More than one-third of the American public has signaled great concern about Chinese firms investing in American companies, according to a Hill+Knowlton Strategies survey. Still, the U.S. government’s Committee on Foreign Investment in the United States (CFIUS) is holding top-secret meetings concerning the purchase of Smithfield Foods by the Chinese firm Shuanghui International Holdings Ltd. The Chinese company needs CFIUS approval to buy out Smithfield in the biggest Sino-U.S. deal ever. But who exactly owns Shuanghui and what influence could the Communist regime exert? Ownership of Shuanghui is difficult to ascertain given that the financial statements are not readily available on the Internet, but a Wall Street Journal June 3 article states that the company, originally a Chinese state owned firm, is 4.2 percent owned by New Horizon Capital, co-founded by the son of the former Premier Wen Jiabao. Other investors are CDH Investments, a Shanghai-based firm, the Goldman Sachs Group, Ireland-based Kerry Group PLC, Singapore’s state-owned investment company Temasek Holdings Pte and Shuanghui’s employees and management, according to the firm’s website. “It is important to keep in mind that there is often not much of a difference between “the Chinese government” and “Chinese corporations,” states a June 6 article on the Economic Collapse website. Americans need to understand that even if the Chinese state does not have a controlling interest in a company, the respective firm will not go against the will of the Chinese. According to Zacks Investment Research’s May 30 analysis, Smithfield Foods will operate as a wholly owned subsidiary of Shuanghui, continue to be based in Virginia, and none of the executives, management, or employees will lose their jobs. Related Discussion: Should the United States and the EU sign a free trade agreement? When it comes to foreign investment in the United States, China’s share is comparatively small. It has been increasing, however, and the motives need to be questioned. “If China continues to build economic power inside the United States, it will eventually become the dominant economic force in thousands of small communities all over the nation,” warns the Economic Collapse article. Just looking at the Smithfield Foods purchase, a Chinese company would get ownership of a firm that operates in 25 U.S. states, which provides jobs for around 46,050 people, according to Smithfield’s 2012 annual report. 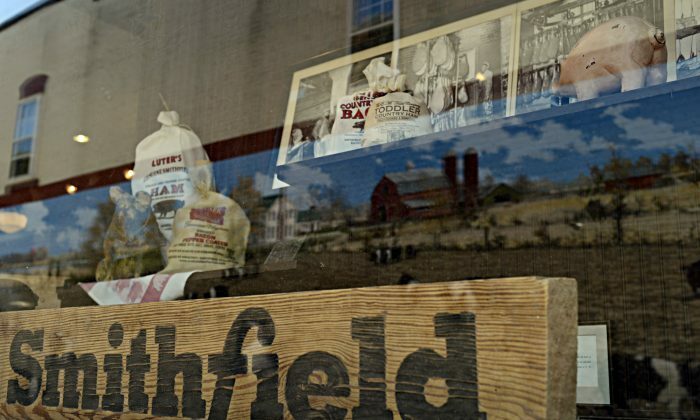 The Economic Collapse article states that Smithfield operates 460 farms and contracts operations to another 2,100 farms, resulting in a controlling interest by a Chinese company in many rural areas in the United States. The deal is worth $4.72 billion in cash and $2.38 billion in debt that Shuanghui is going to carry over. For example, China is building a $100 million plant in Alabama, providing jobs for the locals, but also helping the Chinese regime take a foothold in America. The Wall Street Journal also cites CNOOC Ltd. and the Sinopec Group, which have acquired stakes in oil and gas developments in eight of America’s states, including Colorado, Michigan, Ohio, Oklahoma, and Texas. In total, Chinese money has paid $25.4 billion for 650 different industry investments throughout the United States between 2000 and the first quarter of 2013. Of these investments, 189 investments were carried out for $16 billion by the Chinese state and the remaining 461 investments were made by so-called private enterprises, according to the Rhodium Group China Investment Monitor. While the motives for making strategic investments in the United States are not entirely clear and the sums so far involved are small, the U.S. government has been warned. It acted to prevent the takeover of California energy company Unocal by Chinese oil major CNOOC in 2005. Nonetheless, a clear directive or stance on Chinese investment in the United States has been oddly missing, something the United States government needs to change; it is China, not Germany that we are dealing with.